Honey Singh Live 4th Feb 2012 Nehru Place - At JYNXXX Club Nehru Place Online Passes Available - Passes Online Available of Honey Singh Live Concert Nehru Place Delhi. 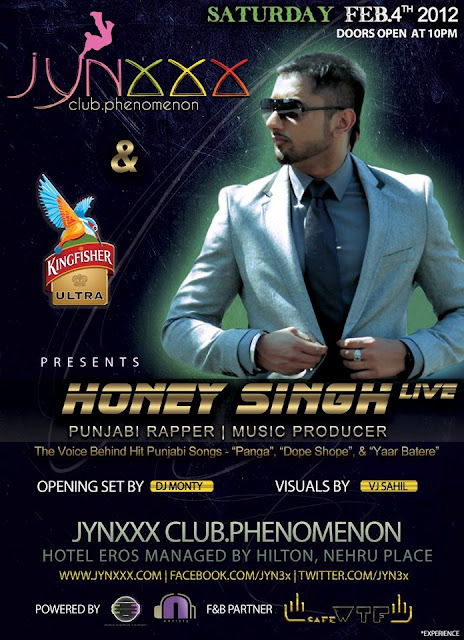 Honey Singh Live At JYNXXX Club On Feb 4th 2012 Passes Available - Punjabi Rapper | Music Producer Yo Yo Honey Singh and Mafia Mundeer Will Perform Live Show in JYNXXX Club Phenomenon On 4th Feb 2012. Full Address S-1, American Plaza, Hotel Intercontinental Eros, Nehru Place, Delhi, India 110019. For Passes: 09766695666 / 9958993395. Tags: Honey Singh Live Shows, Honey Singh in New Delhi, Honey Singh JYNxxx Club Videos, Honey Singh and Mafia Mundeer Live Show in Delhi, Honey Singh Live 2012 JYNxxx Video, Honey Singh 4th Feb Live Show, Honey Singh JYNxxx Club Passes.